Ecwid for WordPress is like a powerful eCommerce Ferrari for small businesses. Ecwid enables you to leverage the power of WordPress and take WordPress E-commerce to a whole new level. It literally helps you leverage all the powerful features of WordPress, while boasting some unique features of its own. Ecwid is a modern eCommerce tool that seamlessly integrates with your WordPress site, enabling you to sell on all platforms with ease. Ecwid is completely cloud based, so you have no need to install any software on your laptop. Being cloud based makes Ecwid accessible from everywhere with no need for updates, installations or file backups. What is Ecwid on WordPress? 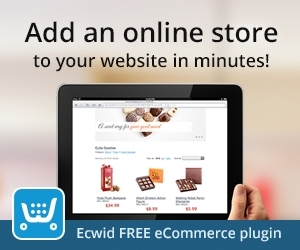 Ecwid is a modern platform that integrates with any eCommerce store hosted on WordPress. Ecwid, which is used by over 1.6 million sellers worldwide, enables you to easily customize your WordPress store and make it seller-ready. In simpler terms, you’ll be able to transform your standard WordPress site into a powerful eCommerce platform to sell to your clients. In this WordPress Ecwid review, we will take a closer look at the benefits you can have by using Ecwid on WordPress. We’ll also dive deeper into tips & ideas on how to customize your site, SEO principles and Ecwid WordPress demo. Without further ado, let’s dive straight into the subject and discover why you might want to use Ecwid for your WordPress eCommerce. You can basically set up your Ecwid account on WordPress in minutes. No other eCommerce plugin allows you to do that in such a short span of time. Ecwid is made to work flawlessly with numerous plugins and devices. Because this tool is available on the cloud, there is no installation involved on your PC or laptop. All you need to do is install the plugin on your WordPress site, activate it and voila! Your design is preserved, and your site is ready to use within minutes. You can customize and personalize your store in just a few quick steps. You can also manage your site from multiple devices you own. Because all changes are made to the cloud, you can rest assured that no change will ever be lost. Let’s say for example that you want to change an important element on your site, or add a couple of extra products with a 50% code. You don’t have your laptop with you, but you use the tablet. You then go on your mobile and change the delivery method for two other products. All of these changes are saved and become operational on the site within seconds. Once you get back to your main laptop, you’ll notice how these changes have improved your conversion rate and brought you more sales. That’s how easy it is to set up and update your online store. With the Ecwid WordPress plugin, you have the benefit of being able to sell everywhere, at the same time. You can easily sell on mobile phones, tablets, desktops, websites, social media platforms and even on huge marketplaces such as Shopping.com, Amazon and Google Shopping. One of Ecwid’s strongest selling points is that is seamlessly integrates with thousands of platforms, including social media networks such as Tumblr, Instagram and Facebook. You will be able to get there where your customers are and showcase your products to every potential customer. Be at peace knowing that your Ecwid store will adapt to the screen of any device. No matter what device your customers use to shop online, they will perfectly see your products and will have no technical difficulties whatsoever to order from you. Another huge advantage of using Ecwid eCommerce on WordPress is that you can sell on multiple social platforms. You can design a store similar to the one you have on WordPress and upload it on your main social accounts, including Facebook, Instagram or Tumblr. On Facebook, Ecwid is the #1 eCommerce app. It contains over 40,000 stores who enjoy up to 15% increase in conversion rate and get a huge potential by marketing to hundreds of millions of Facebook users. You can easily get your own eCommerce store set up within minutes right on your Facebook business page. With Ecwid, you have the huge opportunity to sell globally. This platform supports over 40 international payment methods. The storefront translates to 50 unique languages and comes with real-time shipping integrations. The whole payment and shipping process is smooth and effective, so you can rest assured that every one of your customers will get what they ordered. Moreover, you’ll gain the peace of mind that all the money will be wired into your account. You will be completely in control of payments and you’ll be able to extend your reach to millions of clients worldwide. The eCommerce shopping cart plugin comes as an integral, secure and user-friendly solution to help you get a fully functional shop right on your site. This plugin seamlessly integrates with your WordPress site, making it easy for you to manage the shopping process and also making it easy for clients to buy from you. You don’t need any prior HTML experience in order to set up this plugin and leverage all its functions. Within minutes after activating the plugin, you will be able to integrate it into your Ecwid store and start selling your products to customers worldwide. The modern Ecwid plugin for WordPress offers automatic language translations, so that you can sell to customers from over 100 countries. You can use one of the hundreds of pre-defined Ecwid WordPress themes and templates and improve your store’s navigation and aspect. The Ecwid eCommerce shopping cart plugin offers numerous high-end features, including automated taxes & shipping, mobile apps to manage sales and track inventory, Facebook capabilities, unlimited storage, over 40 payment options, HTTPS security certification at checkout and free support from knowledgeable support experts. Leveraging the power of the Ecwid shopping cart is by far one of the greatest benefits of using Ecwid eCommerce on WordPress. Which is Better: Ecwid or WooCommerce? The naked truth is that finding the right eCommerce tool for you is not an easy task. Most people know WooCommerce, which is a world-renowned WordPress plugin for eShops. However, Ecwid, even if it’s not as famous as WooCommerce, it could prove to be much more effective than its counterpart. In the Ecwid vs WooCommerce standoff, Ecwid outranks its direct competitors in terms of reliability and ease of use. Small brands, particularly startups and freelancers with no coding experience, can dramatically boost their ROI by using Ecwid. If you do not have a developer or you cannot afford to hire an agency to update your site, then Ecwid is the right choice for you. Ecwid is also an excellent choice for you if you are looking for an omnichannel eCommerce that would allow you to sell on any platform. 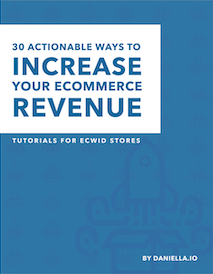 While WooCommerce only allows you to sell via WordPress, which is pretty much limiting your potential, Ecwid opens you up to a whole new level of reliability. This plugin allows you to sell on multiple platforms online thanks to its advanced integration features. You can basically use Ecwid to sell on WordPress, Weebly, Wix and any other partner sites. You can also create Facebook and social media shops, plus sell anywhere online, using a wide plethora of devices. Of course, you can easily migrate from Ecwid to WooCommerce in case you need it. Here is a quick guide to help you. Ecwid offers a plethora of powerful, easy-to-use plugins for both versions of the WordPress – WordPress.com and WordPress.org. Sign in to your profile, go to Plugins and then type “Ecwid” in the search box. Look for “Ecwid Ecommerce Shopping Cart” plugin and then install it. After the plugin is successfully installed, go to it and set the Active and Auto updates to on. From the plugin page, you can go to your WordPress page or the plugin page. To add Ecwid to WordPress.org, simply open your WordPress admin area, go to Plugins and search for “Ecwid”. Install the program, activate it and then click the “Connect” button in the side menu to connect your store to the WordPress site. In case you do not have an Ecwid account, create a free account, grant permissions and go to your dashboard. You’ll see the new Store dashboard there. As you have noticed, adding Ecwid to your WordPress site is a breeze. However, when it comes to adding Ecwid to multiple sites, things get a little more complicated. We will explain below how to exactly do that. The great news about Ecwid is that the store can be embedded to any type of site or platform. All you have to do is copy the embed code for the store, paste it on a page on your site, and your new Ecwid eShop is ready to rock and roll. With this feature, you can easily add your Ecwid store on multiple WordPress sites, as well as on any Wix, Weebly or Adobe Muse. To find the embed code of your shop, simply go to “All Sales Channels” tab, then click on the site of your choice. You can install the code on any platform and site builders, or even add the code to a custom website using Ecwid’s widget. To add it to multiple WordPress sites, just follow the steps above in the section called “How to Add You Ecwid Store to Your WordPress Site” and repeat the steps on as many websites you own. 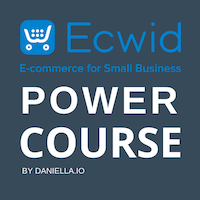 Learn more in the Ecwid eCommerce Power Course where I explain how to customize your Ecwid store and drive sales on your WordPress site. The ability to embed your live store on several sites at once so easily, with no coding required, is something very unique to Ecwid. This is one of the biggest business opportunities you can gain access to. The benefits you can get are just exceptional. First, you can manage your sales from one place. If you manage more than one site at the same time, you want to centralize all transactions and products, and you want to have a hub of command. With Ecwid, you can accomplish this extremely fast. From marketplaces like eBay or Amazon to social media platforms like Tumblr, Instagram or Facebook, you can rely on the omni-channel you have in Ecwid. This platform centralizes all your sales and makes it easy for you to manage your stocks, add/remove products and modify settings. Second, a huge benefit you can get by embedding your Ecwid store on several sites is the amount of targeted traffic you can generate. All you need to do is to ensure that the websites you are embedding your store on are in the same niche, and they are pertinent to your target niche. You can even work with affiliates or partners who are in the same niche as you are and incentivize them to use your Ecwid store. This is a win-win situation for both of you. Now that you have installed the Ecwid widget, it is time to start playing around with its features and discover the amazing things you can do. You can easily take your store to the next level by configuring every aspect of it. You have access to every part of the Ecwid configuration page. You can customize the way your Ecwid store is placed on your site and you can update many sections. To start, go to your WordPress dashboard, scroll to the “Pages” section, click “All Pages” and look for the “Store” page. That is the standard page created by Ecwid once you install it on your WordPress. If you click on “Edit”, you will be able to visualize the backend editor of your store. This is the place where you can do basic customization. You can remote search bars, add categories, and modify columns. To do some advanced customization, go to the “Ecwid” tab in the Dashboard window, then scroll to “Advanced” and check the “Integration with Search on your site”. This option will enable users to conduct searches on your site and find your products synchronized from other sites. To change the looks of your store, simply go to “Design” and play with the settings. Remember, once you change something, do a preview to see how it looks live. You can also display the “add to cart” widget. Go to “Appearance”, then “Customize” and customize the “Ecwid” section. Make the shopping cart to show on all pages, and even show when empty. You can also add the store to the sidebar widget of your site. Further on, you can customize the shopping cart design and fine-tune its design. In the same “Customize” tab, go to “Layout”, “Border” and “Icon” and change how the shape of the shopping cart widget looks. Choose your favorite icon, select the border type and choose the right position. Ultimately, you can go to the Store Menu and add important links to the main elements of your store. You can add the Cart, My Account, Product Search, Store and Store with Categories. You can also activate the following sidebar widgets: product search, shopping cart, store page link, store root categories, latest added products, recently viewed products and random products. Ecwid WordPress SEO is a crucial part of your success online. Most people will find your store organically, so you must make sure that your site is SEO-optimized. The great news is that both WordPress and the Ecwid plugin are SEO-friendly. You will get higher rankings on WordPress than on other sites. However, you still need to deal with the competition. Below are some essential SEO practices you need to implement on your Ecwid store in order to gain an edge over your competition and rank high in search engines. Remember, the higher you rank, the easier it will be for you to be found by your target customers, who won’t hesitate to purchase from you. Do not set your expectations too high in the beginning. You might not top the search engine results as soon as you launch your store. However, it’s definitely possible to get there, with hard work and time. While Ecwid let search engines know that your store is live and is suitable for high rankings, it is up to you to let search engines know what your store is about. To start off, we recommend you to install the Yoast SEO plugin. This is absolutely the most advanced SEO plugin, and when set up properly, it can help your site rank really high in search engine results. You can find out more about it here. An important part of SEO is meta data. You need to ensure that you create separate, unique titles and descriptions for each product you own. To do that, go to Ecwid control panel, then Catalog and Products. Open each product, go to the SEO tab at the top and add a page title and meta description. While you should use your main keywords when creating the meta title and description for your products, you should also keep researching online in order to discover other meaningful keywords that you can integrate in the copy. On the site, you can add a description of each product. You can easily outrank your competitors by creating 300-words descriptions about your products. List their benefits and come up with unique ideas on how people could use your products. To rank high, you need to brainstorm the terms people use to search for your products. Look on Google, check social media streams and also look on Quora. Check the related terms that appear right at the bottom of Google’s search results pages, and look on Twitter for important hashtags that contain relevant keywords. Once you put together a complete list of hot or trending keywords, add them into the text. The great thing is that Ecwid automatically generates clean URLs that contain your choice of title and keywords. The URLs are free of hashes and characters. Of course, you can also change the URLs for each product right on WordPress. While you should use your main keywords when creating the meta title and description for your products, you should also keep researching online in order to discover other meaningful keywords that you can integrate in the copy. On the site, you can add a description of each product. You can easily outrank your competitors by creating 300-words descriptions about your products. List their benefits and come up with unique ideas on how people could use your products. To rank high, you need to brainstorm the terms people use to search for your products. Look on Google, check social media streams and also look on Quora. Check the related terms that appear right at the bottom of Google’s search results pages, and look on Twitter for important hashtags that contain relevant keywords. Once you put together a complete list of hot or trending keywords, add them into the text. Ecwid on WordPress is the perfect way to skyrocket your company’s potential and to boost your sales. Leverage the SEO tips listed above and create a powerful, SEO-optimized eCommerce store that is better than any site on WooCommerce of your competitors.